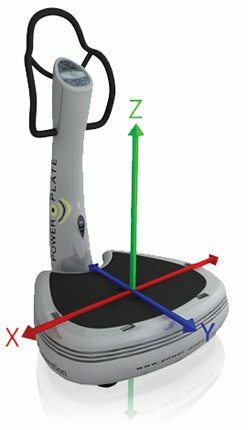 How Does PowerPlate Whole Body Vibration work? Acceleration Training(TM) with PowerPlate machines creates instability in the human body. With each vibration the body is forced to perform reflexive stabilizing muscle contractions, multiple times per second. Furthermore, these contractions must work in all three dimensions as the PowerPlate mimics how the human body is designed to move as you go about everyday life. The net result is a large improvement in power output created by the body. Many forms of training and conditioning use mass – as seen in methods with weight machines, free weights, etc. PowerPlate machines, instead, use the second half of this equation, by applying acceleration to the body, while keeping mass, i.e. your body weight, the same. This is a real breakthrough in training and conditioning as we can now optimally “load” the human frame while minimizing high impact, high load and high stress factors which can ultimate be detrimental or cause injury to those people performing the exercises. Gravity is the force that adds load to the human body every second of every day for every movement we perform. Through Acceleration Training(TM) exercise, PowerPlate machines make the body feel as though it “weighs” more every time acceleration forces increase. The end result is that you work against a far greater influence or “load” of gravity in every movement you perform. This is the essence of all strength and conditioning programs and theA PowerPlate machines simply use a different part of the same equation to achieve this! In fact, the amazing outcomes seen with Acceleration Training(TM) exercise respect the same biological and physiological laws of the body as witnessed in other forms of training. The only difference is the type of the stimulus applied (i.e. acceleration) with the end result remaining the same. That end result is increased metabolic activity, balance, strength and coordination.